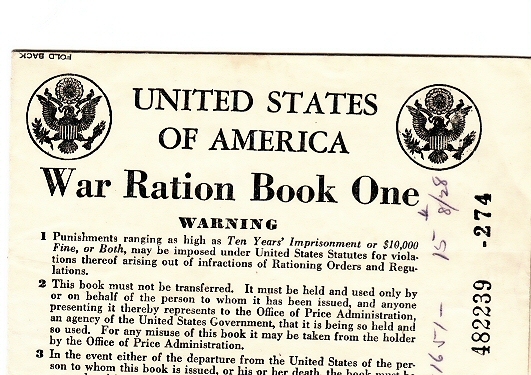 "WII Ration Book One - 1942. " Book was issued to Stephen Allen Card who was 8 months old at the time. Lived in South Apalachin, NY. This is the certificate of regeistrar with the complete description of Stephen. Book number is 482239 - 274. Included as a loose piece is a sheet with instructions to read before using the 5 pound home canning sugar coupons. The name on this sheet is Mrs. Abel. J. Card. Residence was South Apalachin, NY Book measures 5 " by 4". Price: On Auction +shipping.